Stone failure can quickly transform gorgeous granite or limestone cladding into an eyesore. 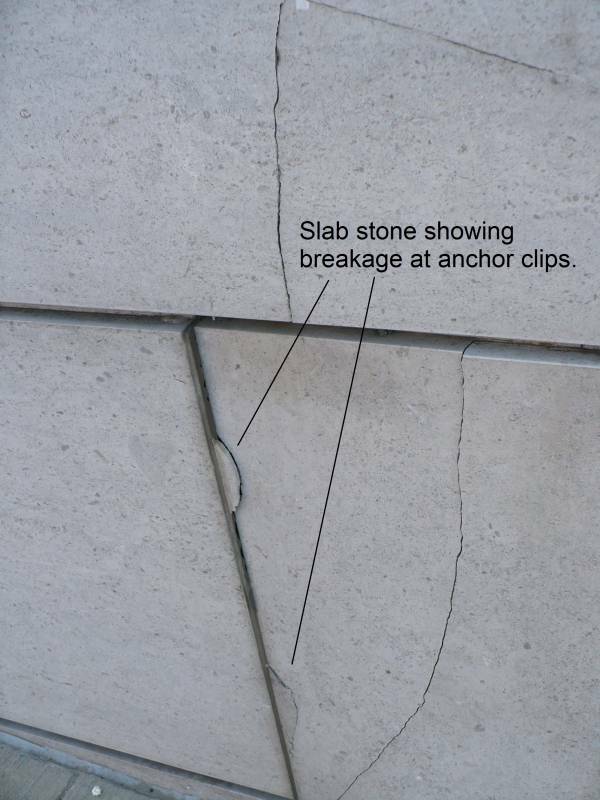 Breakage, fractures, and cracks can often be attributed to installation methods that place excessive stress on certain sections of the cladding system rather than to poor quality or inherently weak stone. With the right installation methods, the risk of stone failure can be minimized to ensure cladding systems remain in good condition. Clips and dowels are common tools for installing natural stone cladding panels. In this method, holes are drilled into the edges of natural stone panels that will be adjacent to each other. A dowel is inserted through an anchor clip and used to adjoin the two stone pieces. The end result is that a very small portion of the stone must bear the brunt of the stress due to wind loads, impacts, and bending, which can lead to failure in the form of cracks or even shattering. Errors and miscalculations during installation-such as failing to leave adequate space to allow for the contraction and expansion that occur in all stone-can also lead to fractures. Overall, the failure rate for this type of attachment system is quite high. StonePly panels are usually installed using one of three methods. In the Z-clip system, panels with Z clips on the back are slid into a Z molding that is mechanically attached to the substrate. In the concealed screw system, the back of the natural stone panel contains numerous plates that extend into the joints. These plates are then secured to the substrate with screws, which are completely hidden in the finished product. In some instances, the panels are affixed directly to the substrate with structural silicone. In every case, unlike with clips and dowels, loads are spread out over the entire panel so no single section is subjected to undue stress. The installation methods for and properties of StonePly panels can reduce the risk of stone failure associated with systems that use clips and dowels. This is just one advantage that makes our lightweight natural stone panels preferable to slab stone. For more information about applications and benefits, visit the StonePly website. We are always available to answer questions and provide free initial consultations and estimates. You can get in touch with us by filling out the form on our contact page or by calling 903-454-4630.